The following discusses the final two episodes of Halt And Catch Fire’s third season. A day after AMC renewed Halt And Catch Fire for its fourth and final season, the series took one small step for period dramas, one giant leap for depictions of the personal computing boom. As you can read in The A.V. Club’s review of season three’s two-part finale, the show skipped four years ahead in its timeline, bringing a show that was previously set in the 1980s into the flannel-clad, Windows-running, Pixies-soundtracked ’90s. The A.V. Club spoke to showrunners Chris Cantwell and Chris Rogers about the big time jump, blowing up relationships, and where the show is headed in season four. The A.V. Club: When did you learn that the show had been renewed for a fourth—and final—season? Did it have any effect on how you planned the end of the third season? Chris Cantwell: It did not, because we learned about the renewal yesterday afternoon. [Laughs.] So we actually found out within 45 minutes of the press release going out, and we scrambled to notify the cast and get our quote in and everything. We were really elated. And we’re also really elated that we get to conclude the story on our own terms. But in terms of the way we ended season three, it was written very much like we wrote the ends of season two and season one, which was we concluded the story of that chapter and tried to make it as fulfilling as possible, maybe leave a few threads here and there should we get to continue. We made something that was satisfying for the audience and then cast our fate into the wind. It’ll be a little different in season four—we’ll know it’s the end—but we just like finales like that as TV viewers ourselves: ones that give you a conclusion but also a little bit more where you could see where things could go. AVC: Have you always hoped you’d be able to take this story all the way up to the 1990s and the World Wide Web? Chris Rogers: I think the answer to that is “absolutely.” When this show got picked up initially and we shot the pilot, if you’d told us we were going to get 40 installments of it, we would’ve thought you were insane. But I think in our wildest dreams, we did think that the dawning of the internet and the World Wide Web might be some crucial part of that journey. So this season, as we thought about where a third season might go, Chris and I went out to Joshua Tree [Laughs.] to hunker down and read library books and talk about what we wanted it to be. And we loved this idea that maybe the final image of the season would be this “www” coming across the screen. I think it’s a place we would’ve loved to have gotten in previous years, but we felt like we couldn’t leave all that story on the table, and it felt earned. We’re pumped to have made it this far, and to have 10 episodes to spend [in the world of the web] is a fitting way to take this story out. 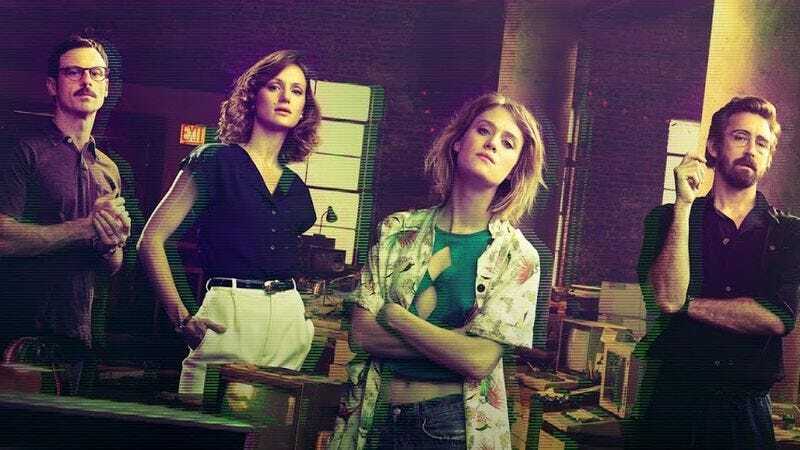 AVC: Halt And Catch Fire’s period setting has been a distinct part of its identity. How does it feel to move into another decade? Does it hurt to leave some of those ’80s signifiers behind? CC: We’re excited. Even beyond the ’80s of it all, our show has been one about reinvention. The tech-industry setting really helps that—it allows us to blow things up and start over, just as our characters do, and we’ve been true to that and unflinching with that when it comes to every season, where it feels like, in some ways, a different show each time we start again. We’ve left a lot of things behind, and it was kind of a scary decision to say, “Let’s leave the ’80s behind and let’s get to the ’90s, and what do our characters look like in the ’90s?” The “always new, always moving forward” quality of technology and the story and backdrop that provides allows us to do crazy things like that. At the end of the day, the show is really the five characters that are at the center of its story. We’ve got them, and I think the people that watch the show will continue to want to watch where these people go, no matter what decade they’re in. AVC: Let’s go back to the writing of that time jump: It’s clear that some time has passed at the beginning of “Nim,” but it’s not confirmed how much time until we see the copyright line on Donna’s version of Windows. CR: The time jump was something we wanted to do coming into the season. In that same “lost weekend” in Joshua Tree, we wrote that down as a “God, do you think we could pull this off? Do you think we could get to this?” because we felt that there was so much immediate story to tell about Mutiny and Joe coming to California, and those of first six months of them adapting to this new culture—the sort of “strangers in a strange land of it” all. But we knew we wanted to get to “www,” so we decided this was going to be a season about people getting there early—people with the right idea at the wrong time. This pursuit of e-tail is an idea that historically was happening in ’86, but wasn’t really born out by market or technology forces—until 1990, where we end up in the time jump. We also really believe in using all of our story as quickly as we can—we didn’t want to slow-play anything. And so as huge things—like Cameron and Donna splitting up and Ryan’s death—were taking place in episodes seven and eight, that just seemed like where they naturally wanted to fall and gave us the opportunity to make a big time jump. And it scared us, and it felt bold. On a show without guns and the traditional drama-increasing mechanisms they have on other shows, we try to make those choices. I think people are going to be really disoriented for a little bit. But in a good way. That episode, which is directed by my better half, Chris Cantwell, has this wonderful reveal that will leave you saying, “Oh, my god, are we in the 1990s?” Then you see that big COMDEX banner [Laughs.] and the way Cameron’s hair is, and all doubt is removed. AVC: The midseason time jump has become a stylish storytelling device in recent years: Breaking Bad famously did one in 2012, and though it wasn’t the first, many other shows have followed suit. Did that give you any hesitation about breaking out your own time jump? How did you want your time jump to be different? CC: We had so much story left on the table at the end of season two, and we knew we wanted to get to the World Wide Web, so essentially we wanted to have our cake and eat it, too. We knew that other shows had done it before—but we jump four years. Which, if you look, is longer than how long the characters have known each other from season one to season three. And so there was just that type of creative audacity and challenge to do that long of a time jump that it felt irresistible. It felt like rebooting the show right in the middle of it, in a way that I hadn’t experienced in other shows on TV. You’re right: Audiences have seen things like that before, so we hope that people wouldn’t be completely lost and go, “What the hell just happened?” But I think we catch ’em before they fall all the way. AVC: Are there any moments in the characters’ lives that you regret not being able to depict on screen? CR: Absolutely. We made some choices, and one of the hardest ones is to not see the final dissolution of the Clark marriage. That had been a thing long coming in terms of the struggles they’ve had. But we decided there was something more truthful and original about showing something that faded out quietly. There are episodes this season where we deliberately didn’t have Gordon and Donna speak to each other. They were in scenes together and they didn’t talk. We wanted it to be a slow fade-out, versus a catastrophic fight, which is how they’d ended the previous two seasons. And in a way, you get into these binary relationships with a show—they’re doing well, they’re not doing well, they’re fighting, they love each other—that we wanted to get away from. So we thought splitting them up in a way to change their relationship and give it a new track was something we wanted to do. We don’t get to see the last days of [their marriage], nor do we get to see the last days of Mutiny—it was whittled down by the market and just didn’t win out, but it had this reboot attempt in MNet that also failed. There was something elegant and evocative about making those choices that, in a perfect world, it might’ve been interesting to see. But at the same time, we were happy with the execution of nine and 10 in terms of suggesting those things without actually getting to see them. AVC: It’s haunting to see Gordon and Donna apart and to return to the empty Mutiny offices. Is that something you were going for? How did it feel seeing Scoot McNairy and Kerry Bishé portraying a divorced couple? Were you emotionally affected watching that footage? CC: What was exciting about that footage—and I think also haunting—was you’re looking at something, and you think you know what it is. You say, “Oh, yeah, that’s Donna and Gordon!” But they seem different, they have a different maturity to them, and the way they interact with each other is different. So it felt new, and there was something exciting about that, too. With the Mutiny offices, it felt like there were a lot of ghosts surrounding the characters in the last episodes, and I think that was fun—to see if they could get past those ghosts and decide to work with each other again. The answer is yes in some ways and no in others. AVC: Can Joe ever truly separate himself from Cameron? What keeps him trying? Is it as simple as the confession of love he makes in front of Gordon? CR: I think it may be more complicated than that. We always conceived of Joe and Cameron as two characters who wear masks to the world. In the pilot, and in their initial relationship, they see each other behind those masks. On some fundamental level, even though they hate to admit it, Joe and Cameron really get each other. I don’t think that’s just romantic love, though. They’re into the possibility of each other—they’re both in their own way zealots who badly need to be part of the future, who badly need to be right. And so the attraction is a little more nuanced than that. Cameron, at the end of season three, is pretty conflicted about how she feels about Joe. There is a force that keeps drawing not only those two, but all of these people together, in that they feel like they’re at the epicenter of some kind of change. They do bring this incredible work out of each other, even as they’re doing this incredible violence to each other. There will always be something between Joe and Cameron, but the nature of what that thing is is ever-evolving—and arguably a dangerous property for both. AVC: Cameron’s relationship with Donna evolved into such a complex friendship in season two. What was it like to blow that up in season three? CR: Oh, man. It was painful. It really was. One of the only hard things about Halt And Catch Fire is we do tend to repeat this theme about a lot of partnerships trending toward entropy, and trending toward conflict, and inevitably having to break apart. And what we built between Donna and Cameron was one of the most beautiful examples of a partnership that worked and something that we rooted for and enjoyed writing. But it also felt true this season to stress that partnership and test it with their new surroundings and weigh it with the pressures of success. With Donna realizing maybe she’s really good at this and coming into her own, and with Cameron looking around her life and trying to decide what matters to her. It felt like a conclusion that it would’ve been false to avoid and to steer away from—but yeah, it hurts us. [Laughs.] That scene at the end of episode seven where those two lay into each other—it was so important to us that they have their best arguments there. But that meant having two, smart, well-meaning people go at each other in terrible ways. As members of a partnership [Laughs.] that we hope will last a long time, and that we work very hard on keeping civil and good, it always hurts us when Donna and Cameron fight. But the same is true of Joe and Gordon. These people come to feel like your friends, and it’s never fun to see Mommy and Daddy getting into it. AVC: The season opens with the question “Are you safe?” Episode eight ends with Ryan’s suicide note, which is labeled “You are not safe.” Is there a definitive answer to the question, and what about safety and security did you want to explore in this season? CC: If there is an answer to that question, I think it is “You are not safe—but it’s worth it.” What we wanted to explore with the characters on a personal level was that they all start a little guarded and a little at sea, with their places at the company or in their marriage or at the heads of their company. That’s true for Joe, Ryan, Cameron, Donna, Gordon—even Bosworth. They all become concerned and closed off from each other as they become insecure about their futures and what’s next for them. But then they start to really open up to each other, and I think some of that honesty is good and some of that vulnerability is good. It reignites Joe’s passion when Ryan comes to him and the two of them start working together. But it’s also what can get Joe into trouble. When Joe is excited and zealous, that’s when Joe is the most dangerous—and there are grave consequences to that. Ryan goes all in on something, and the ambition is too much for him. He’s a casualty of the story. Cameron plays very guarded with her company and worries about it being taken away from her, and because she can’t let go of that fear, when she finally opens up, her worst fears come true and the company is taken away from her by her partner and close friend. Donna and Gordon try to preserve their marriage when Gordon votes for the IPO—and then we see that the Clarks have gotten divorced. All of these endeavors to play it safe blow up in their faces. And then when they make themselves vulnerable, that also causes some damage. Donna attempts to go back to Cameron at the end of the season and tries to repair the past and open herself back up to Cameron—and ends up getting hurt by Cameron more than she has ever in the history of their relationship. It’s the resilience of the characters and the hope for connection and the hope for how things could be better. And all those connections, however painful they can be at times, are what make their lives worth living. Safety is something to hide behind, and when the characters step out, that’s when they’re rewarded, but also that’s when the most pain can occur. AVC: Suicide is such a sensitive topic, and in fiction it can be so easily misused for shocking or exploitative ends. Can you talk about your approach to Ryan’s suicide? CR: That is a storyline we were very afraid of. And right up until the episode where we finally solidified it on paper, we were open to the possibility that that was not what was going to happen to Ryan—that there might be more of a future for him, and he might continue on the show in other ways. But as we examined that character and how much this project meant to him, how much it meant to be part of this future—we thought it felt earned. Execution is another thing: We were very worried about the execution of those scenes and that they were done with tact and sensitivity. At the end of the day, these people do such emotional violence to each other, and the stakes are usually getting there first or winning at business. But they always make it, even if they are a little damaged or changed. And we wanted, in Ryan, to show somebody who really paid the price of this, who really felt the consequences of these actions, and who wasn’t as resilient and who did take this personally and seriously. All of which is to say we were thrilled with the way Manish Dayal dialed in that performance. From the beginning, Ryan is a guy who goes to Joe’s office and pronounces he needs this, nobody listens to him, this is huge, and he can’t stand the thought of missing it. We felt like he was telling you from the beginning that this was a possibility, and we tried to keep his performance consistent throughout in earning that. Big credit to the actor for pulling that off. It is going to leave a huge scar on the rest of our characters and hopefully make them gun-shy and slower going forward in terms of the consequences of these choices. AVC: Is there any tease you can give us of where things go next? CC: Only that the World Wide Web will be involved, in some shape and form. We’ll have to figure out the new permutation of how Donna, Cameron, Joe, and Gordon all fit together, and in what ways they may be opposed. That’ll be the fun of it. CR: And maybe some flannel shirts. AVC: Joanie’s on the cutting edge of that fashion. CR: Oh, yeah: Chris already got us there!